Speaker of the House Mark Eves gives a presentation in this April 22, 2015, file photo. 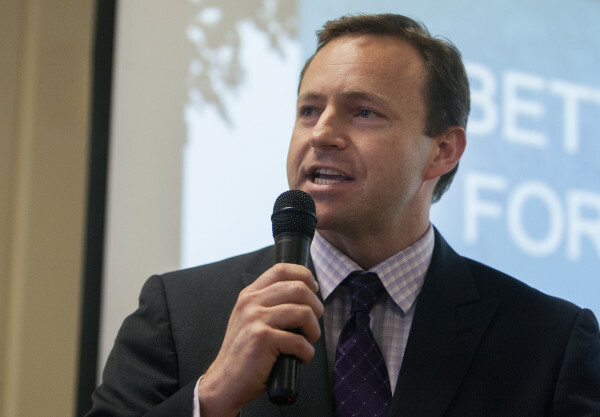 FAIRFIELD, Maine — The Good Will-Hinckley board of directors has rescinded its offer to House Speaker Mark Eves to be the next president of the organization, which includes the Maine Academy of Natural Sciences charter school in Fairfield. Good Will-Hinckley and Eves, a Democrat from North Berwick, signed an employment contract in late May, prompting a scathing response from Republican Gov. Paul LePage, who argued in a letter to Good Will-Hinckley that Eves’ prior opposition to charter schools should disqualify him from the position. The Bangor Daily News reported Wednesday afternoon that a major donor to the school, the Harold Alfond Foundation, told the school it would withhold $2.75 million in grant funding if the state funding dried up because the school’s viability would be thrown into question without the state aid to house residential students. Sources close to the school’s board told the BDN the possible funding cut stemmed from the school’s decision to hire Eves as president. Eves was hired as Good Will-Hinckley’s president after a nine-month search by the institution. He was scheduled to begin the new job on July 1. Eves has been a family counselor in the past and has said that, despite his past opposition to the legalization of charter schools in Maine, he was attracted to the Good Will-Hinckley job because it involves helping at-risk children. David Webbert, an Augusta-based labor law and civil rights attorney who has been hired by Eves, said LePage has violated the First Amendment of the U.S. Constitution. The incident sparked an angry response from Republican Sen. Roger Katz of Augusta, who serves on the Appropriations Committee, which oversees the state budget, and the Government Oversight Committee, which oversees the Legislature’s watchdog arm, the Office of Program Evaluation and Government Accountability.